On Monday 26th October Hackney Council's Cabinet agreed to await a structural engineers report on the condition of 2-8 Ashwin Street before deciding whether to demolish the houses. Over the summer the public were being consulted about how the Dalston Masterplan should retain the best of our local character. Options for the Ashwin Street houses included providing a new home for Arcola Theatre . ONn 30 July 2009 the Council's Property Services obtained agreement, from the Council's Planning Department, that if the Ashwin Street houses were to be demolished planning permission would not be necessary. 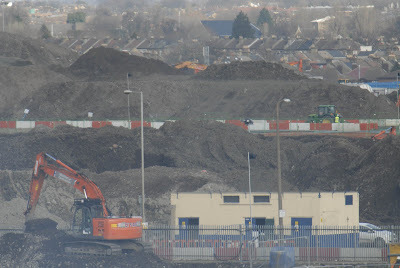 Members of OPEN Dalston objected to the demolitions without further investigation. We asked for an independent survey of the houses before irreversible decisions were made. The Council's Cabinet listened and agreed to this request last Monday. Meanwhile Ashwin Street holds its breath. This latest round of consultation is part of a lengthy process which began with the Council obtaining a consultants' report back in 2007. Their recommendations covered most of the issues which are now part of the Council's consultation. 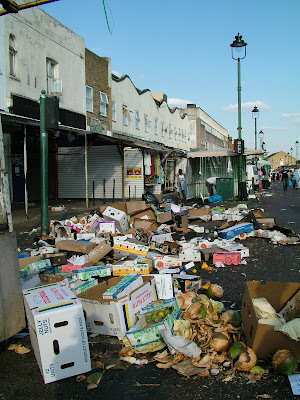 The consultants noted that traders are charged £430,000 a year for waste management but found "the worst market environment we have ever experienced in over 30 years". The consultants' recommendations included a profit-led approach to market management so that the Council could obtain income by increasing the charges trader's pay for licensing, storage, electricity and parking. Ridley Market is presently the "Home of the Bargain" and, for many, a vital source of affordable goods and fresh produce. Increased charges to traders would inevitably lead to higher prices for customers. The consultants also suggested cashing in on Council assets, particularly the market storage land in Birkbeck Road, by identifying "potential disposal opportunities... of land for residential development". Ridley Road's market traders are at the hub of Dalston's retail diversity, and its vitality, so why have they had so much grief? One of the first of the consultants' recommendations to be implemented was a crack down on traders by a restructured Council enforcement team. Since 2007 OPEN has reported on the prosecutions of traders (which were later declared by government to be"not in the public interest") rumours of a Council agenda to redevelop some of the market's land (strongly denied by Hackney's Mayor Pipe), electricity supplies to traders stalls cut off since May 2007, the sudden closure of the traders' market store and traders' appeals against revocation of their licences. 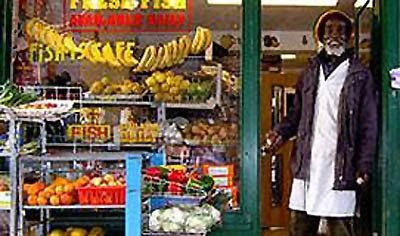 The Ridley Road Market Traders Association (RRMTA) has been consulted and it supports many of the Council's improvement proposals - refurbished lighting and electricity supplies, road and pavement upgrades, better publicity and gateway signage, improved waste collection and recycling and equal size but larger stalls. The RRMTA particularly favours improving the St Marks (east) end of Ridley Road market, part of which is on private land, and encouraging people to shop along its entire length. But the Options the Council present make no express mention of refurbishing the market's store that was closed last year (although some work is going on there presently), or the storage yard for traders barrows, which are both in Birkbeck Road. When you look at the Council's proposals you'll see it is pushing to do away with barrows in favour of uniform stall types - flat pack stalls to be set up and dismantled daily (by someone) and stored (somewhere) off site - to "improve the look of the market". Nothing to do then with the consultant's recommendation that doing away with the barrows would "leave a considerable piece of land available along Birkbeck Road. LBH may wish to give consideration to alternative use of this area of land possibly for Residential Development"
Neneh Cherry and Andi Oliver buy some bunches of callaloo. It's the home of the bargain - but how do we keep it that way? Tory conference learns about Spirit and "Tesco-fication". 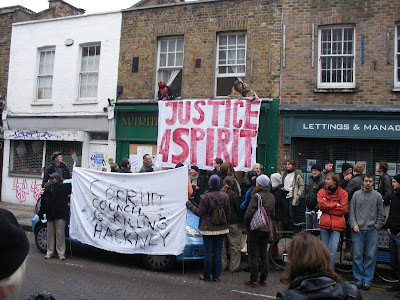 In this video clip Graeme Archer tells the Tory Conference about how local people, and particularly Spirit, were powerless to prevent Hackney Council auctioning off local businesses to off-shore companies in 2002. The auctions were not just of properties in Broadway Market but a Georgian terrace of thriving businesses in Dalston Lane too - and just look what has become of them. Despite Council policies, and crocodile tears, the Dalston shopkeepers were deprived of the opportunity to buy their shops when the terrace was put in the auction as one lot and many have since been evicted. 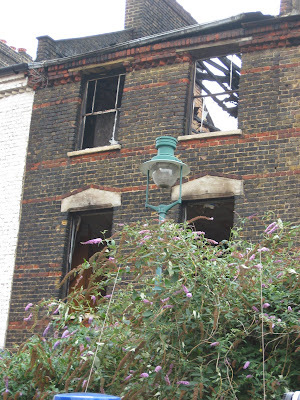 Then there were arson attacks and four houses were burnt out. The Council have since, at public expense, demolished three of the houses. Following recent public consulation the Council's planning brief for the terrace is awaited. Graeme Archer also raises the issue of the "Tesco-fication" of our high streets - the loss of retail diversity, independent small businesses and local character. Local communities are resisting this all over the country. Tesco have an outstanding planning application for the major redevelopment of its Morning Lane site which includes two thirteen-storey residential tower blocks on top of a new store. The development will dominate St John at Hackney churchyard gardens and Hackney's earliest monument - the 13th century Grade 1 listed St Augustine's Tower.You can see and comment on the application on Hackney Council's Planning Department web site here. "....Where possible, a supermarket operator underwrites the whole development, erecting towers on site, so that Hackney becomes a suburb of Tesco, with streets, permanently under cosmetic revision, replaced by 24-hour aisles. Light and weather you can control. Behaviour is monitored by a discreet surveillance technology..."
Watch BBC film here of the first train to arrive at Dalston Junction since it closed in 1984. The line will start taking passengers next June. Lowell 'Spirit' Grant has lost his claim against Hackney Council for compensation following the sale of his home and business at auction to an off-shore company. "He was plainly proud of the business which he had built up since 1993. It is sad that this was taken from him " said the Judge "It is unfortunate that these offshore companies are purchasing properties and are able to avoid the same fees and taxes which others would have to pay". Spirit had wanted to buy his property and met the Council's property agents, Nelson Bakewell, prior to the auction. Although he had handed over his cheque for £10,000 deposit, and signed a document, the property was later sold at auction for £15,000 less than Spirit had agreed to pay. The cheque was later posted back to him without explanation. The Council's agent agreed it was possible that Spirit may have signed something at the pre-auction meeting but the Judge found that, whatever it was, it was not proved to be a sale contract. The property agents later returned the file to the Council but despite investigations by the Council's Internal Audit, and a Scrutiny Committee Inquiry, the document has never been produced . The Council's agent said that Spirit must have known of the auction of the property well in advance because he had been there to measure it up. Why the auction catalogue described Spirit's residential flat above the shop as 'storage' remains a mystery. The Council's agents gave evidence at the trial, which the Judge accepted, that they went ahead and auctioned the property because Spirit had told them that his cheque would not be honoured. A member of Spirit's family said on oath that they had agreed to make an immediate transfer of funds. Following a three year battle, and despite all the rent being up to date, Spirit was evicted last year for failing to pay the off-shore landlord's legal costs awarded in its possession proceedings at a time when Spirit had no legal representation. The Court of Appeal found that in the case of business tenants the Court did not have the same power, which it has for purely residential occupiers, to allow them time to pay. Should we beware the east wind? Extensive radioactive contamination has been found on the 2012 Olympic site. OPEN has made an appeal for funds to meet the cost of commissioning an independent nuclear scientist to report on the working methods and risks arising from the excavation works on the site at Stratford. .